The latest SonomaVegMap Newsletter is out with some fantastic stories including Wider Access to 2013 LiDAR Data, LiDAR Assists in Road Design, and Vegetation Classification Work. Go to http://sonomavegmap.org to read it. There are four courses being offered by SRJC for the Spring semester. They are GIS 40 (Intro to GIS), GIS 51 (Intermediate GIS), GIS 52 (Advanced GIS), and GIS 56 (GIS Applications in Land Planning). Go to Schedule of Classes for more info. The County of Marin has an opportunity for an extra-hire Cadastral Mapping Technician to assist with performing cadastral mapping work, drafting of maps for assessment purposes and providing mapping customer service at the public counters and via phone and email. The ideal candidate possesses experience with Autocad and graphics editing, and has familiarity with surveying, California Real Estate Law, and Marin County geography and land use. The ideal candidate also has the ability to provide excellent customer service and work well independently. Please see the Cadastral Mapping Technician class specification which includes the required minimum qualifications. The Sonoma County Water Agency is seeking qualified candidates to fill one (1) extra-help (temporary) Geographic Information Technician I vacancy. If you are interested in this position please go to the County of Sonoma's Job Posting to apply. The largest GIS Event in the North Bay is coming November 19th to Santa Rosa and we need your help! We need you to spread the word about it, participate in it, and attend! GIS Day is only as successful as the effort our User Group puts into it. .
Post the event on your website. Go to our resources page and download images to use on your site. Do you or your agency have an interactive map online for public consumption? If so, send us a link to it. 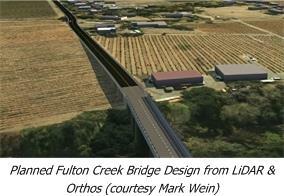 We are putting together a new page on this site which will showcase the interactive maps for our region. 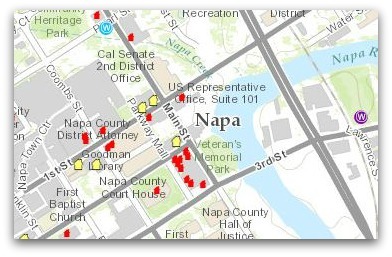 The City of Napa has released an interactive map showing locations of damaged buildings, water leaks, and debris dropoff sites. You can view the map at http://ow.ly/AN09W. Warning, the latest story map for our area is highly addictive. Click the image below to see just how much has changed in the Santa Rosa Plain since 1942. You can read about this project on the SonomaVegMap Blog. Yesterday during the Plenary session Esri showcased their new product ArcGIS Pro using data from the North Bay. Videos of the Plenary can be viewed at http://video.esri.com/series/198/2014-esri-user-conference. 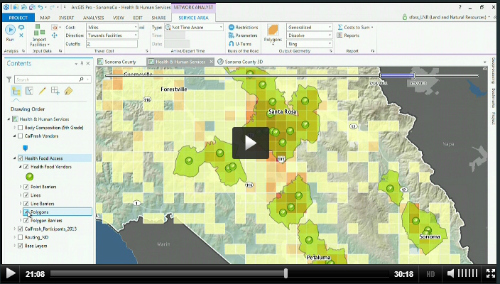 To just view the North Bay data part go to the 11:45 mark on the "Where Will ArcGIS Pro Take You?" There are four courses being offered by SRJC for the Fall semester. They are GIS 40 (Intro to GIS), GIS 53 (Cartography in GIS), GIS 54 (Data Acquisition in GIS), and GIS 55 (GIS for Earth Science). Go to http://www.santarosa.edu/schedules/schedule_of_classes/ for more info.